We normally don’t criticise judges. We normally don’t question their judgement or wisdom. We obey the simple rule “Do not judge the judges”, after all, through our democratic processes; we are the ones who put them there. We also fear being hauled up for contempt of court and being dumped in the cooler for incurring the wrath of some judge. But what happened on January 12 was neither in a court nor a judgement on any case. Four SC judges — Justices J. Chelameswar, Kurian Joseph, Ranjan Gogoi and Madan Lokur ran to the Press to whine about something. Even Darth Vader wouldn’t know what exactly their grievance was and what they wanted to whine about. Such a thing is unheard of – Judges running to media, and it is against the code of conduct for judges. To avoid mentioning their names repeatedly, I will just refer to the four as “CKRM” being initials of their names. Among other things, it seemed that the Gang of Four was unhappy with the kind of cases they were getting to try. It’s like a salesman in a company complaining “You gave me Siliguri but you gave the other guy Coimbatore”. Seriously, judges have any right or prerogative to decide what kind cases they should get? NO! NONE WHATSOEVER! It is completely up to the discretion of the CJI to assign cases to any judge or bench he considers appropriate. Judges cannot be choosers. The moment judges start lobbying over which cases they should get, then it betrays a vested interest and a window for inevitable injustice. Having organised and executed this revolt by the Gang of Four, we had an extraordinary spectacle. We had Justice C meeting Daniel Raja, a worthless politician who is in RS only because of crumbs of TN parties, and we are asked to believe there is nothing political about this. Raja goes to meet C through the “Exit” gate of his residence so that he’s not caught by the media. But in this day and age of mobile cameras there is always someone lurking around somewhere to catch you peeing on the “No parking” sign. 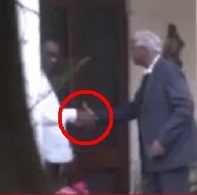 Raja was similarly caught by a camera leaving C’s residence with a warm hand-shake. If you wanted to meet your “long-time” friend as Raja claimed, why would you go to his residence through the exit gate? Good you did, because this meeting exposed the entire clandestine operation of the Presser of the Gang of Four and the political motives behind it. So now the Commie Pigs will even demand which judges they want on which Bench and on which cases. Fantastic! Every SC judge, whether junior or senior, comes with a substantial load of experience and it is to avoid prejudices and biases that we have a “Bench” rather than an individual judge. With almost less than 1% of representation, these Commies keep demanding their way of life. Their kind of justice and life belongs in a garbage can and not in public discourse. Every media crook that has stood up for the Gang of Four is a Commie and that says a lot about the whole orchestrated rebellion for no reason or rhyme. 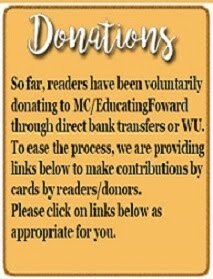 And what does it say about the character of CKRM? You guys will adjudicate disputes and offer justice on millions of disputes in this country and yet, you are incapable of solving your own problems in-house? I have long said “Winners are busy doing business, Losers run to the media”. And that is an indisputable fact. Only the corrupt run to the media in fake victimhood and defence. The Gang of Four has demonstrated they cannot continue as judges anymore. Imagine four senior managers having grievances against the MD of a company running to the media to complain about him. What would happen to them? THEY WOULD BE SACKED INSTANTLY. I don’t see how this Gang of Four can preside over the destiny of many litigants with their biases, prejudices and political persuasions. We cannot trust them anymore. They should be impeached and sacked. Period! As for the Supreme Court... Yes, there is a desperate need for reform. The CJI may be no angel but this is no way to settle differences within the SC. Judges cannot appoint themselves. GOI must strongly take up the NJAC again and implement it. Justice Gogoi was line to be the next CJI. He should be superseded because he has violated the code of conduct for judges. This is misdemeanour that cannot be reward with a higher position. The SC is not the Congress party where abject failures are promoted. Also, this Collegium crap is unconstitutional. I hope ModiSarkar finds the courage to restore the image and trustworthiness of the SC. The Gang of Four should honourably resign and continue their political career with some political party. This does not look even murky. Its out in the open - Congress is abashedly manipulating every possible move to unseat Modi in 2019 and is firing ammunition of every nook and corner it has fitted in various parts of govt. machinery. Sooner Modiji weeds such malicious persons out better it is for govt. to function objectively. Ravi Sir. An apt post indeed. I had bile regurgitate from all known orifices, when I read about 4G (gang of four) presser and Modi government need a spine to act against CONgi nautankis against Indian democracy and judiciary. I did not understand what was going on. You clarified everything. Thank you. Awesome. Nailed it with precision!!! G4. Would have liked if role of IJ was a bit more explained. How these lowlifes can influence judgement in important case like 2G scam. Her husband sat b4 OPS for 7 years not signing & submitting docs...!!! Before he even thinks of cleansing the system, Modi has to first purge his own Cabinet of "Closet-Congis" who have successfully sabotaged everything that he is passionate about. RaviNar Money talks and it talks more in India. Let Judges declare their affiliation to the political party of their choice and their earlier judgments since they became judges so that like here in USA people in India also know whether he is a conservative Judge or a Liberal Judge or a swing type. But I still feel Loya's case should go to conclusion because what his sisters said and postmortem taking place without the family's consent are not small matters. As I said Money Talks or Money keeps you silent. This is Kaliyug. Very few have priceless tags. Well balanced judgement of the situation. The return obligation by the four is in the open and makes mockery of methods employed by the musketeers. All the more reason for the cleaning of the judiciary needed here. The influence of some lobbies in media and politics is seen here in action. They made a fool of the judges and themselves. Good this episode happened. Hope this won't happen again because of the sorry face seen by public at large. 1. Two days back, CJI Dipak Misra ordered a special investigation team (SIT) to reopen 1984 Sikh riots cases and investigate 186 cases related to it. 2. Last month, CJI Dipak Misra slammed Kapil Sibal when he asked to postpone the judgement of Ram Janmbhumi case after July 2019. 3. Justice Dipak Misra is leading the bench which will pass judgement on Rama-janmabhumi case. 4. The collegium, everyone knows is a part of the "ecosystem" created over the last 7 decades and has always thwarted efforts to let "outsiders"come in the circle. 5. Well, the campaign against Dipak Misra, maligning the CJI (a constitutional post) baselessly and asking his impeachment a day after he ordered reopening of Sikh riots case and is set to pass judgement on Rama-janmabhumi case shows the power of ecosystem. As retired SC Judge RS Sodhi said, "These four judges have formed a union. There are 23 other judges as well. This trade unionism to malign the office of CJI is immature and uncalled for. These 4 judges have no right to sit in the highest court and must be impeached." I agree with Justice Sodhi. 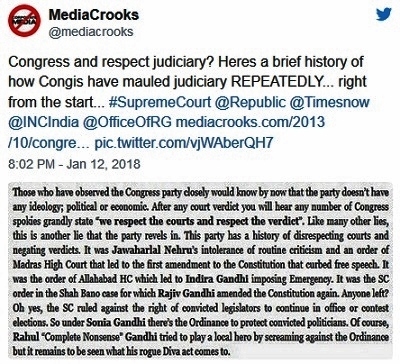 Fantastic narration of the hypocracy in judiciary.This move is one of the larger designs of the Congi,commie,media nexus added with judiciary to defeat Modi in 2019.Their design has been exposed by SM,some sensible Media n some conscientious men from legal fraternity !However Modi govt has a lot to b watchful n have to act as suggested by MC. Mera Qatil hi mera Munsif hain, kya mere haq mein faisla dega. With each uproar, think a wolf (Khangress) party citadel is falling. The judges were sitting ducks. The entire Khangress stooges woke up at unearthly hours i.e. morning 03:00 hrs waiting for the event, just like award wapasi gang. Khangress wants Modi govt to be depicted to have fallen on every account. They cannot imagine a Chaiwallah doing better than Maun Singh or "licensed Pilot" (nani yaad ayegi !!!). 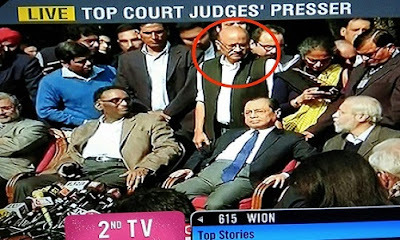 These so called "senior judges" need to be sacked or made to sit without a case (sit idle) for rest of their service, to set an example for all other aspiring Khangress sponsored judges. The judges seemed not to know why they were agitating. My simple advice to BJP govt at centre & at state, to be wide awake, activate all intelligence agencies, to catch these Khangress stooges red handed, for Khangress still has the brains & resources to start communal flare-up like the one did in Maharastra. Be alert & if necessary tap all landlines & mobiles of Khangress including Pappu. Do not underestimate the nuisance value of Khangress. They need to be crushed & smoothered under the road roller. Khangress has many stooge informers in every govt segment. identify them & throw them out to Siachen & Far East postings. It has long been known that the bureaucracy and the media are politicised. Now, it looks like judiciary too has been politicised. This can go horribly awry. It's now the responsibility of judiciary to reset the course. 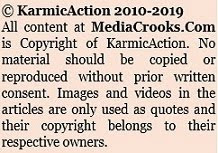 If this correction is made voluntarily and embedded into their ethics, CKRM would have redeemed some of their fallen prestige. Kudos for such a sharp and incisive write-up. Their presser before the media itself is a shield against any contempt of court! CKRM have themselves emphatically stated on record and in public that all SC judges are equal and the CJI is merely first among equals! Then where is the question of junior judges and senior judges??? The Gang of Four have themselves eviscerated their own argument! Excellent exposure of the Gang 4 and their supporters. Democracy in India will be in peril, if the Cong is out of power...This is what Cong says, which conveniently forgets the Emergency imposed by India G...Cong cannot come to power doing such low level politics, as people have become intelligent to know the design of every party. Govt /CJI, SC, should see these gang of 4 resign or action to be taken to remove them, as they have violated the Judicial Ethics. Are there any Commie or Congress stooges present who do not live in Delhi, at the PC by this gang of four judges? Like Indira Jaisingh. Does she live in Delhi? Or she travelled especially for this "impromptu" PC? Normally a PC is announced to the media only, unless the PC is planned ahead. Now every judgement rendered by this gang of four judges will be viewed with suspicion. How then these judges can continue? After seeing the dirty lobby of Congis and commies slamming the son of Judge Loya that his father's death was natural and he suspected no foul play here the father of the minor girl from Haryana was seen asking for contact details of Ashanti bhushan.etc to take their permission to file a complaint with the police against his daughters rapists and murderers.He said that he feared that this lobby's permission is mandatory in case of all deaths. After the resignation of Supreme Court justices SHELAT, HEGDE and GROVER IN 1973 IN PROTEST AGAINST indira gandhi govt supersession of junior judge A N Ray for CJI this four judges in the Collegium so called Senior club has stirred another hornests nest. I had been witness to that episode and the folliwing incidents that happened to Superior Judiciary. IN 74 march Mrs Gandhis poll case was decided in march at Allahabad HC which unseted and within fortnight time Emergency was declared by the then PM for personal reason. During emergency The Real powerless PM(she was denied voting rights by Justice VR Krishna Iyer) executed a coup in Costitution by destabilising or ruining the document n fiddled with the lifeof citizen. People reeled under dark age n including leftists countrymen suffered.Now these judges seemed to sppear with grievances but J.Chelameshwar confabulating in berween presser with j Gogoi made me sense doubtful of their unity itself. They had stunned the lovers of independent judiciary..They had infact became bad examples of liberal and forthright. They have lost confidence. Better they quit n honourably go ahead with politicians whom they can depend forbetter prospects.! It is about Sri Ram Janambhoomi, period. The wretched sickular gang knows that in law the case for Sri Ram Janambhoomi Temple is solid. If a judgement in its favour comes, its curtain for them in 2019. However, there is another major hurdle in the way. That is the BJP itself. In my opinion, the BJP really doesn't want the Temple, for them it is no more than a vote giving cow, a jumla. Like UCC, 370, KPs, scamsters or the loot in foreign countries. To be used for electioneering and power. It is Ram Janmabhoomi Indeed. And if you challenge likes of Kapil Sibal and Indira Jaising., they are more than capable of driving such scenes. I wish the "fours" should have seen that before revolting. They are the ones to loose. I still recall the way Kabil Sibal has treated Senior Police officers during Kanhaiya Kumar's Patiala court episode. Amazing article dear Ravinar. Is there any possibility that Justice Mishra us given extension till the time Justice Gogoi retires ? This seeems to be a hornet's nest for Modi Sarkar to handle. If a normal citizen goes against any judge, s/he will be held as contempt of court. But this CKRM Gang of Four fully supported by Congress party and its corrupt stooge media are opposed the Chief Justice of India. They should be held on contempt of court and should be prosecuted. Why different punishments for normal citizens and “hon’ble” judges?? I agree with everything mentioned in the article, but the last line mentioning Modi Sarkar will take necessary action is the issue. The moment Sarkar steps in we all will again cry of interference in judiciary. Thanks what is the solution?? 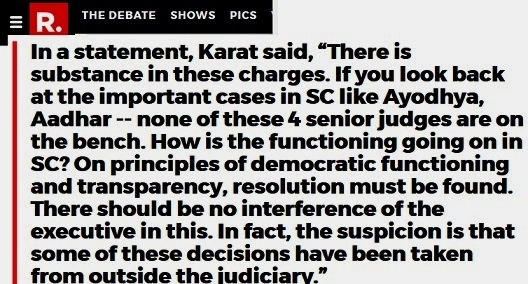 The moment, understood the Dirty Four were agitating on Justice Loya case, where Khangress Stooge Indira Jaising & Dushyant Dave are directly involved & can be seen joining the Dirty Dozen in that protest, it was clear that Khangress is playing sewerage politics as it is known for always. India is slowly going towards USA i.e. Nation will be divided into two parties - Pro Khangress / Pro Hindu, in the coming years / decades. 5) Limit subsidies given to Muslim families on all accounts. It is clear that the Sikulars and Commies are upto some machinations to confuse and confound the people. The recent Togadia case in Gujarat too is after the visit by Rahul Gandhi, which surely smells foul.These enemies of the nation will not leave any stone unturned in order to cause some kind of upheavals. People, do not be FOOLED. Sir with a spineless government at the helm,judiciary reforms are simply impossible. Another gang of eight may be waiting on wings who knows.!! I fully agree with the comments of S. KUMAR : "In my opinion, the BJP really doesn't want the Temple, for them it , scamsters or the loot in foreign countries. To be used for electioneering and power." There is serious doubt about the motives of the BJP. The present episode only symbolises the corruption in the judiciary. Two recent instances will be sufficient to buttress this view. A). Remember the setting aside of jayalalitha case by justice kumaraswamy. A combination od the arithmetical errors and his own discretion he had set jayalalitha free. The supreme court overturned his judgement a year later. But did any of us question justice kumaraswamy for his errors. B) remember the case of the SP minister who was evading arrest for months during last days of SP government in UP. When he was finally arrested he was given bail in no time. He retired a few weeks later after granting bail. Apparently the case was arranged in such a way he can grant bail and retire for a fantastic consideration and benefits. Was he proceeded against? Pillars of democracy! My foot!. Rusting in progress on the pillars-Parliament not allowed to function, Media politicised and now Judiciary too. Now G4's judgments would be critically looked-is it not interesting! The motley crowd of hooligans from the opposition would always try to tarnish the good image of GOI; however I have a feeling that people like Jaitley look by action as if they have equal concern with opposition friends too. From a core Modi supporter like me, it doesn't look all that transparent when they deal with cases regarding Vadras or Sonia or Rahul & their coterie. Time. Did you know? All the judges in India come from 400 families? Am I the only person in India who did not know? whether today or yesterday or a decade ago, actually from the time of India's independence come from just 400 families in India. DID INDIA GET FREEDOM ONLY TO BE A SLAVE of 400 entitled families? THIS IS WHY judges oppose PM Modi's removal of the #collegium system which allows ONLY sitting judges to choose other judges. 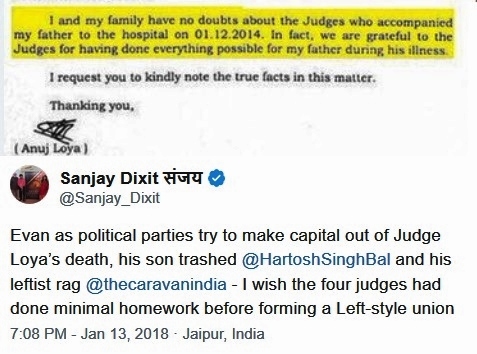 The families are dynastic judges, like the fake Gandhis in politics. BTW: Congress leader Kapil Sibal's son is a Dehi HC judge. Jagmohan's son is a Delhi HC judge. 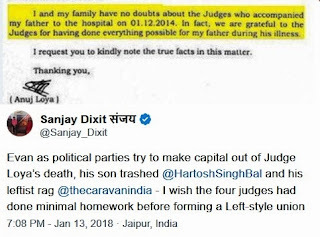 Andley's father/ grandfather were Delhi HC judges like he is. Google "Mathur + judge" and you will get father, uncle, brother, cousin, amma, mama, chacha, taya, bhabi, chachi etc etc. WORST Lot. Endless list in Delhi as you research it. Very Shocking!!! Height of nepotism in Indian Judiciary! THE SELF PERPETUATING INDIAN JUDICIARY. List pending before Supreme court for approval as judges in superior court 73 names are that of sons of judges and 24 names are relatives of political leaders. Similarly, list submitted by Allahabad High Court having 50 person is also bundle consisting of names of sons and relatives of judges, lawyers close to power. 1. Niraj Tripathi son of senior BJP leader West Bengal's governor Kesari Nath Tripathi. 2. Somesh Khare son of former SC CJI, V N Khare. 3. Mohd Altaf Mansor, son of Chief Justice Jammu Kashmir Sagir Ahmed. 4. Sangeeta Chandra chief standing counsel close to Samajwadi Party. 5. Rajneesh Kumar son of Justice O P Srivastva. 6. Abdul Moin brother of justice Abdul Matin of Allahabad HC. 7. Upendra Misra is brother of Satish Misra close confidante of BSP supremo Mayawati. 8. Shishir Jain close to Samajwadi party counsel for PWD and Bridge Corporation of UP Govt. 9. Manish mehrotra son of Justice SP Mehrotra. 10. R N Tilahari son of justice HN Tilahari . 11. C D Singh, chief standing counsel UP Govt. 13. Ajay Bhanot nephew of Justice Jagdush Bhalla. 14. Ashok Gupta son of justice P S Gupta. 15. Rajiv Gupta nephew of Justice P S Gupta. 16. B K Singh brother in law of Justice AP Sahi of Lucknow bench of Allahabad HC. I am one of those who did NOT know that all came from the "gene" family !!! It is a revelation. Believe this must be known to BJP members also previously, why they are sitting idle ? & not talking ?? 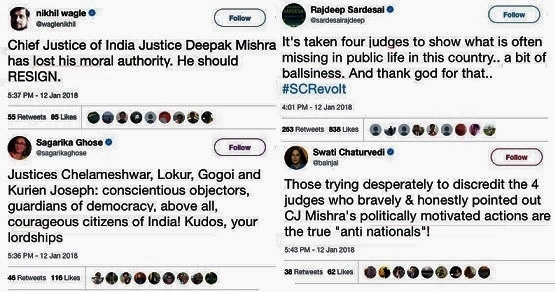 You got it right.With less than 1% popular support, commies want to "dictate" which judge should adjudicate on which case.These four gentlemen have no reason or ground to hold on to their posts.CJI in any case has NOT ASSIGNED any case to them as per their whining in public.Only a thick skinned politico will cling on to his position after such humiliation.Iron is hot now.Modi govt should strike to ensure that all NJAC is introduced for judicial appointments.